This is so great to just have on hand. Add it to pasta, spread it on bread, dip a cracker in it, whatever you want! I also love changing it up by using different kinds of nuts. 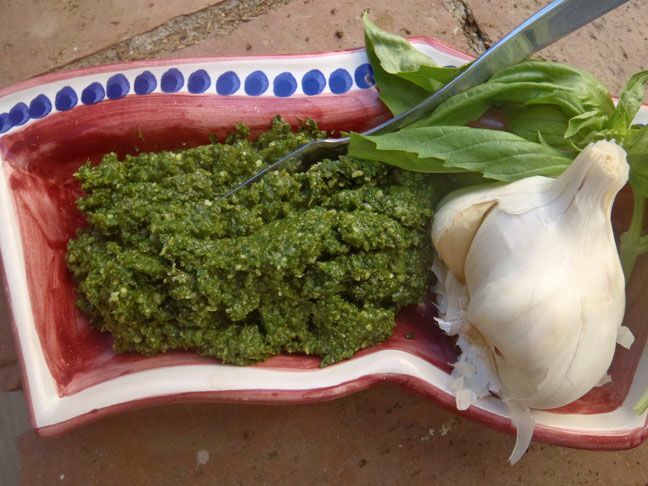 Pine nuts are the traditional choice, but pesto is also lovely with almonds. Using pecans adds a sweet maple flavor. Yum! It should keep for a couple weeks in the refrigerator. All nuts should be toasted before they are added to any recipe because toasting brings the oils and natural flavors to the surface. Toast the nuts in a 375 degree oven on a baking sheet or in a small saute pan on the stove over medium-high heat. The nuts are done when they are very aromatic and golden brown, after about four minutes. Stay with them, though, because they can go from perfect to burnt quickly! In a food processor, with the blade attachment, puree the basil leaves with the nuts, garlic, and cheese. Once everything is smooth, gradually blend in the olive oil. Season to taste with salt and pepper.